Hydraulic Hose is used in a wide variety of industrial applications where steel pipe is not feasible. Its flexibility allows the user the option of routing around obstacles. It is the material of choice where vibration is an issue. It’s available in a variety of tube and cover materials depending on your application. 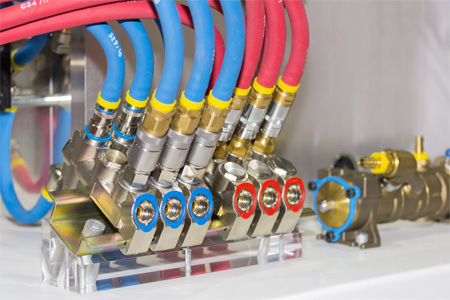 The typical pressure ranges are from suction lines to 10,000 PSI hydraulic applications. As an Eaton Premier Partner, we specialize in sales, service, and support of the Eaton-Aeroquip Hydraulic hose product line. Beginning with our Aeroquip Express Store in our Dearborn location, we fabricate hose assemblies while you wait. We are a leading distributor and fabricator of Aeroquip’s MatchMate Plus, AQP, and HI-PAC product lines. Many types of fittings are available including through the cover (TTC) and reusable fittings.